Appendix Carry is becoming increasingly popular. Five years ago, it seems that the carry position was frowned upon and discouraged, carrying the stigma of shooting your junk off should your trigger finger slip up. However, with practice and training you can become confident enough with your draw stroke and brave the appendix carry waters, as long as you have a great AIWB Holster. There are so many options for Appendix Holsters now a days, it's hard to choose which option is best for you. I highly suggest going to your local gun shop to ask if you can try on different holsters, just so you can determine which style/material you'll like. That will help narrow down your search. Most shops will at least have plastic, leather and nylon holsters. Depending on what your day to day activities are, you may need more retention than what a leather or nylon holster can offer you. If you're a cable guy, or work in construction where bending and moving around is something you do all day, you'll see right off the bat that you'll most likely need a plastic holster with some sort of adjustable retention. Once you figure out the material and style of the holster you want, you can start narrowing down companies who make that style. We make full Kydex, single clip Appendix Holsters. After years of testing, we found that this is the type of holster that works best for us. Our AIWB Holsters are made from a single sheet of Kydex, most commonly called a "taco-style" holster. They have a single clip design, which most believe will not be sufficient to hold and balance a firearm. That is probably true for a lot of people who've bought holsters from companies that just mount the clip wherever they have room, but the clip placement is one of the most important factors for weight distribution, concealment and integrity of the holster. Clip placement may seem like an after-though on most holsters, but this is one of our most thought-out components when making each custom order. Something to look for in any Appendix Holster: minimal material. You're going to want the least amount of material to that you don't have any printing issues. With Appendix Carry the two most common areas that print are the grip and -mostly for women- the muzzle. The grip printing is easily fixed with a good holster. On our Appendix Holsters, we have the option to add a grip concealment claw. The claw is an extra component added when assembling the holster that pushes against the belt, to tuck the grip into the body. There are also several other things you need to think about when appendix carrying such as how your holster is going to sit. With our AIWB Holster you can choose your own cant angle and ride height. This is perfect for seasoned carriers who know exactly what works best for them, but can be very intimidating to first time carriers. What we always recommend for every firearm is an Appendix Holster with a mid ride height and straight draw. That is the most concealable for appendix carry. Comfort also comes into play in this position. For the most comfortable AIWB carry, you can get a high riding holster with a slight reverse cant. This elevates the holster a bit so that there's no leg jabbing. However, with every level of comfort you have, you lose a level of concealability. I don't care what any other company says, you can rarely have both. If you have a desk job where dress code requires a tucked in shirt, there are a decent amount of options for you here. We offer a tuckable AIWB Holster, as well as a Tuckable Modular Appendix Rig. Both allow the carrier to tuck their shirt in over their holstered gun. This does slow your draw time, but having a gun is always better than not having a gun. The final issue: the bulge. Obviously if you're carrying a holster on the waistline, you should be wearing a belt. But how do you carry a single clip Appendix Holster at 12 o'clock with a big belt buckle in the way? Easy- a buckle-less belt. We carry our Modular Appendix Rig Package that include our Appendix Holster and Magazine Carrier Combo Rig as well as a dual layer, bullhide gun belt. 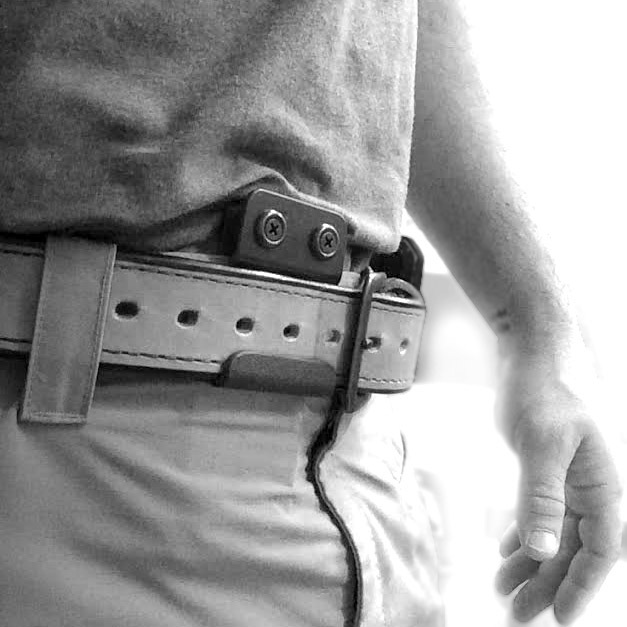 The gunbelt has no buckle, instead it has a strong Velcro layer to fasten it together and keep the bulk to a minimum. This package works flawlessly together and comes highly recommended. -Wear clothing that fits, but is not tight. -Wear a proper gunbelt, even better: one with no buckle! -Make sure your holster has minimal material. -Opt in for the wedge that tucks the grip into the body. -Plan ahead of time: wear larger shirts if you're carrying a larger firearm. -For comfort, wear higher riding pants.